Puma IGNITE NXT SOLELACE ($120)- Puma's IGNITE NXT SOLELACE comes with overlapping grooves across the sole. Intended to give golfers strategic traction throughout their swing, the improvement helps deliver more power to the end of it. Puma calls it "innovation from the ground up." Hopefully, you can call it a few extra yards. FootJoy's FJ FURY ($169.99)- The name is frightening, but the shoe itself is gentle. The FJ FURY has two foam densities working around the clock to keep your feet in fighting shape. The first layer is designed to maintain its form throughout the lifecycle, while the other is an impressionable foam meant to form to your feet. With customized comfort, the provided traction and waterproof leather are an added bonus. GEAR adidas Crossknit 3.0 ($150)- According to adidas, the Boost technology used in the Crossknit 3.0 is the most responsive cushioning they've ever produced. 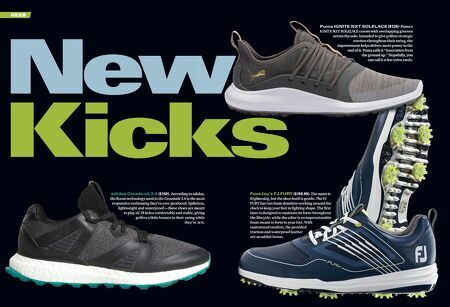 Spikeless, lightweight and waterproof —these shoes are meant to play all 18 holes comfortably and stable, giving golfers a little bounce in their swing while they're at it.